After years of dreaming of building a homespun business, David and Jamie Quigg launched their candied nut business, Nice Nuts. With their purchase of a nut roaster, the business began and alder|creative was called in to design a logo and product packaging for the already named brand. The owner team requested a modern aesthetic with a vintage circus-like feel. We created a bold typefont that included some special uneven edges to give it that special, authentic feel. 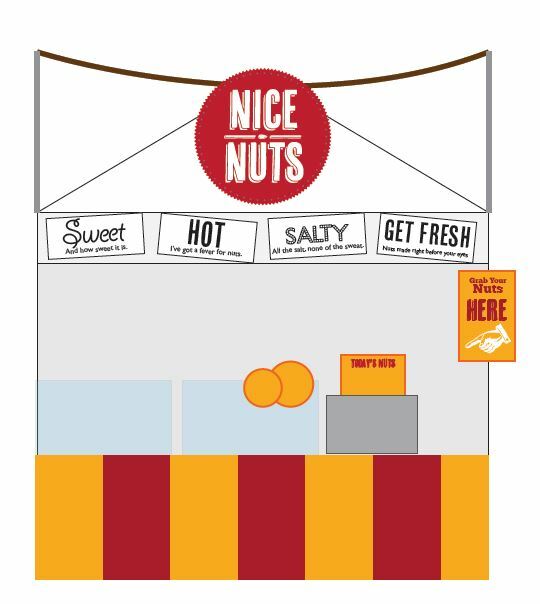 We worked closely with the Nice Nuts team to develop a variety of product packaging options including glass jars, sealed bags, and hot nut cones for events. In order keep their costs to a minimum, they created their own website through a low-cost site builder and asked us to provide some final edits and product photography. Our services don’t stop at graphic design. 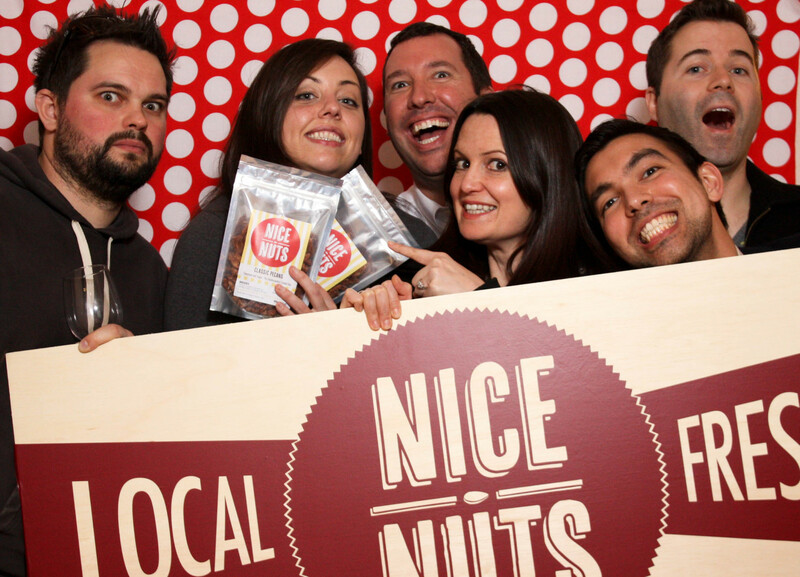 Our experience in the tradeshow industry brought added value to the Nice Nuts business. 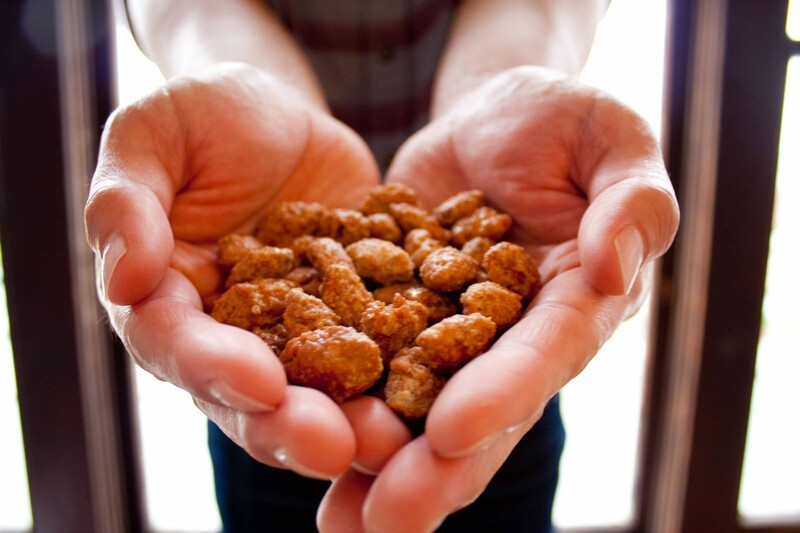 We helped them create and design the ideal tradeshow booth built for on-site sales of hot nuts. In order to build the brand, we reinforced the imagery with colors and styles in line with their vintage circus theme and ensured that all costs and operations expectations were well thought through and planned out in the design. Product photography is essential for showing the world what your business can do. Our photos are often used for websites, product listings, and social media. We love visiting our clients and celebrating their success with them! We know that our clients provide the best products and services around, so we are always there to support them however we can.